Yes, you, too, could be the proud owner of a Bessacarr… this is the 442 and, as well as being a brand new model for 2014, it represents quite a bargain – if you have a spare £44,000 or so. 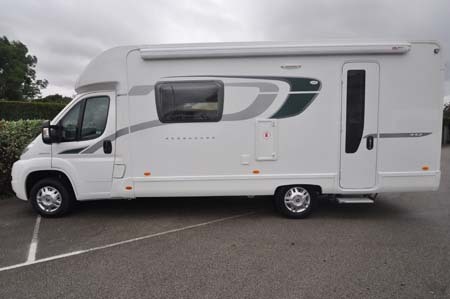 Don’t blink, that really is what counts as a highly competitive price for a brand new, full-size two-berth coachbuilt motorhome these days. If that’s what you’re after, feel free to use this Bessacarr 442 as a benchmark. One of two new model additions to the fully revised Bessacarr line-up, taking the newly-named 400 range up to eight models now but arguably representing a continuing change of course for the Bessacarr brand. If you thought Bessacarr meant premium prices, be prepared to think again. 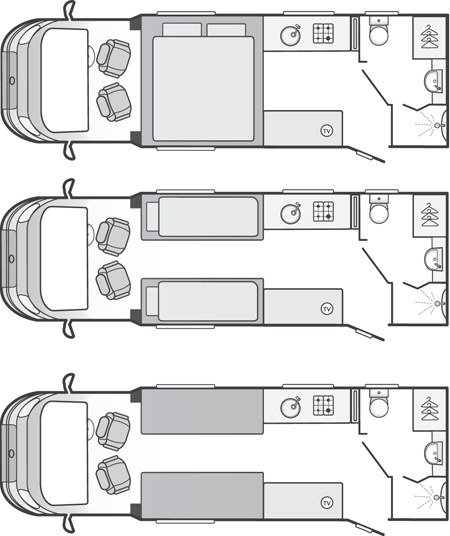 The 442 here is strictly two-berth, featuring a forward lounge of two settees and a full washroom across the back. 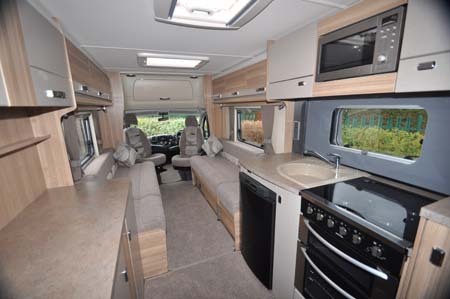 It’s a floorplan that British manufacturers do particularly well, with equipment levels to match our expectations for ‘vans that you can sleep, cook, wash and actually live in. The exterior plays to the understated theme. In all-white with modest graphics that help marry the cab to the caravan, and overall proportions that few would argue against being absolutely spot-on. The end panel is a fully-bonded one-piece section, with fittings that allow for a bike rack to be added, but at a much lower height than usual. There’s just the one engine option here – the more than adequate 130bhp unit from Fiat – although automatic transmission should prove a popular upgrade. Step inside (via a new caravan door for the range, from Seitz) and you’ll note the Italian Ash woodwork and swirly-patterned upholstery, as well as the aforementioned settees – an above-average 1.88m (6ft 2in) in length means converting them to single beds is simple. Alternatively, it’s not much of a harder task to pull together the two settee bases and created a transverse double (2.04m x 1.42m, that’s 6ft 8in x 4ft 3in). In these days where permanent beds are popular, you tend to forget just how much extra living space you can have if you’re prepared to make your own bed each night. 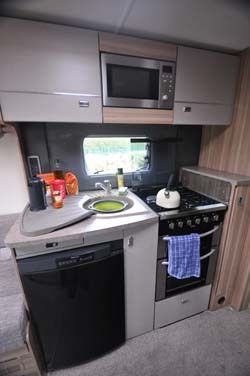 Whichever sleeping arrangement, you still have easy enough access to the kitchen – with cooker and sink along the offside and a full run of worktop along the nearside and then, of course, that spacious washroom. 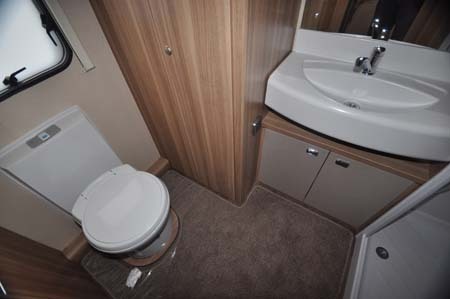 Not only is there dressing space in here (with the wardrobe in here, too), there’s also a proper shower cubicle, a swivel-bowl toilet and a fixed sink. Details have certainly not been forgotten – there’s a window (always better for optimum ventilation) as well as a mirror, towel hook and holder, good lighting etc. On the latter, illumination throughout is LED – consuming much less power than other types. 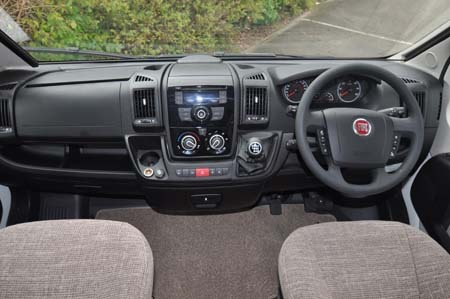 Heating is via Truma’s more powerful Combi 6 system (also providing the hot water), and – again as per all Swift Group leisure vehicles – the vehicle is rated as Thermal Grade 3 for its insulation. There’s a lot of talk about coachbuilt construction these days, much of it more to do with marketing smoke and mirrors. Like others now, Swift says its construction is wood-free now – it’s the rotting of the timber that spells trouble when you get any water ingress – but, most importantly is the backing of a ten-year bodywork warranty. Like all Swift Group products, it also has European Whole Vehicle Type Approval. Brilliant is too strong a word to describe this new Bessacarr. But, that’s not to negate its sheer all-round competence. It’s all rather understated, but might just prove one of the unsung heroes of the year ahead. There’s more information on the 400 range on the Bessacarr website and to find out more about our low-cost premiums visit the motorhome insurance discounts page. 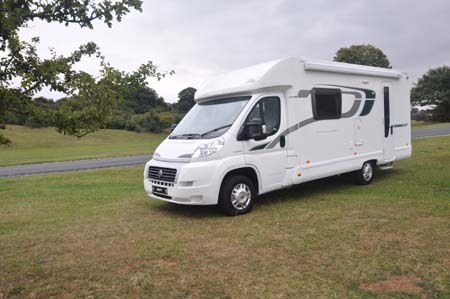 *Motorhome insurance cost based on 2014 Bessacarr 442 retailing at £43,205 with standard fit equipment, manufacturers immobiliser and a tracker retrieve approved device. UK travel only. Kept on driveway at home at TD9 8ED. Motorhome owners – professionals over 50 years old with no claims, convictions or health conditions in last 3 years. 4 years no claims bonus mirrored from car policy and 2 years motorhome driving experience. Members of motorhome club doing less than 5000 miles annually. £300 excess applies. Premiums include insurance premium tax at 6% and are correct at 03/10/13. Yes the fridge is smaller than one would expect. I actually chose the 2014 442 as opposed to the 2015 version as the sunroof above the cab takes away the overhead locker I use for the bedding. 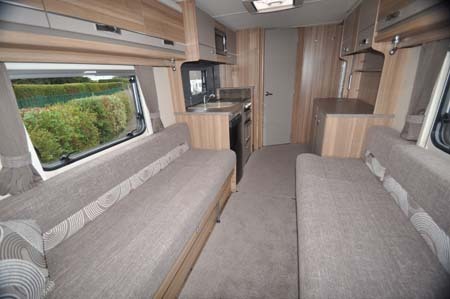 I have looked and still cannot find a Motorhome with a better layout, loads of space during the day. You mention nothing about storage for deckchairs and the like. Looking at the pictures there does not seem to be much in the way of outside lockers? Looks a lovely `van. Pity it still has a small fridge.